Watching the days get longer and longer is also fun to do. I was previously never a big fan of the spring months because I only focused on the crummy weather, but I’m learning to enjoy the ups and downs that spring often brings. Plus, it’s my birthday month so I have to like it! With warmer temperatures in mind, I have not one, not two, but three snack recipes for you today! It’s almost the weekend and I think you should celebrate all your hard work. 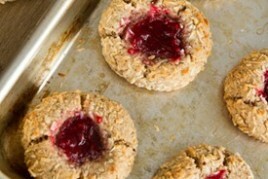 Or maybe whip up a couple treats for your mom on Sunday and share the love. I’m on a popsicle making kick. After a trip to Costco earlier this week, I was reunited with one of my favourite purchases- a huge bag of frozen mango chunks! It appeals to my lazy, don’t-like-to-peel-mangoes side and it lasts forever. I ripped open the bag of sweet potato chips as soon as we got in the door. Oh, right, we’re talking about popsicles here. I think you know what I did after ripping open the bag of chips that Eric said we should save for my party. I blended up mango, banana, almond milk, and a touch of coconut extract. Check out that action shot! I proceeded to make a huge mess while pouring and snapping pictures simultaneously. Then, I waited. Very impatiently. That’s the worst part about making popsicles! Maybe next time I will make them overnight so I don’t keep checking them every half hour. Well, they were worth the wait and then some. Creamy, sweet, tropical…and best of all, just 3 ingredients. Don’t have a popsicle mold? Just use ice cube trays or drink it as a smoothie. It’s a reeeeally good smoothie. I’m thinking I have to make margarita popsicles too? 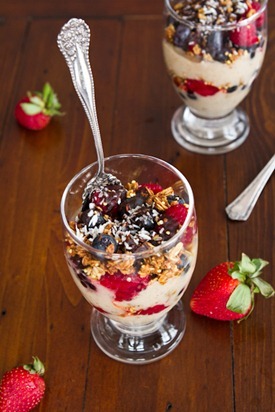 Up next, berry parfaits made with banana soft serve. It’s one of our go-to healthy desserts during the warmer months. Granted, I will happily consume this even when it’s chilly outside, but it’s even more fun to cool down with after a warm evening stroll. 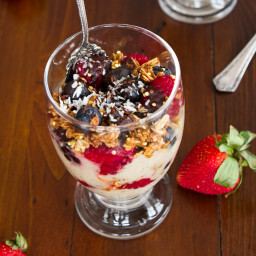 It’s made with processed frozen bananas, my fav Lightened Up Summer Granola, coconut, instant chocolate sauce, and fresh berries. 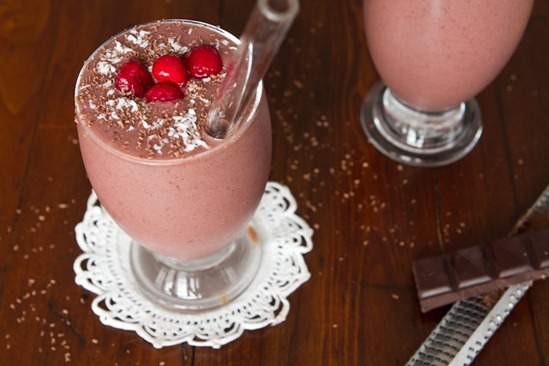 Finally, a chocolate raspberry smoothie, also for two! This just might be my favourite out of all of them. Super creamy with a lovely chocolate raspberry flavour. If my mom lived nearby I would be making her this smoothie on Mother’s Day. John, I’m leaving this as your special assignment! As I mentioned, I’ve been loving raw cacao powder lately. It has a really intense chocolate flavour and so many health benefits. Feel free to use cocoa powder if preferred. Both will work! Looking for more easy snack recipes? 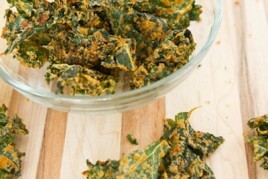 Check out my 22 Ways To Get Your Vegan Snack Attack On Post. 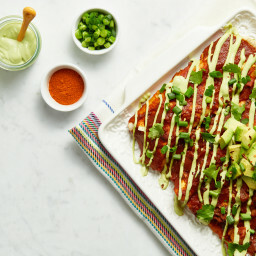 i’ve been working my way through the 22 vegan snack attack recipes! excited to add 3 more! Glad you are enjoying them Robyn! Great post, Angela! 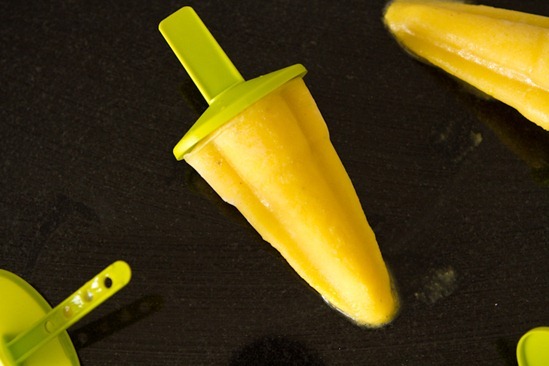 I’ve been thinking an awful lot about popsicles lately… and I always have frozen mango on hand! I keep making mango smoothies, but a nice cool pop sounds perfect for warmer weather. Hey Angela- do you have a Sobey’s by you? We’re going up to Calgary in September and we’ll be staying in a condo with a kitchen close to Banff. In Canmore there’s a Sobey’s, so that’s probably where we’ll be doing our shopping. I was just seeing if you have been there and how their produce/gluten free selection is? Hey Annie, I’m not sure what the Sobey’s natural food section is like. Sorry about that! Maybe another reader can comment to the selection. :) Have a great trip! Love Calgary and Banff. The Sobey’s here in Ontario does not have the greatest gluten free selection, if you are out west you could try to find a “superstore” of some sort. Our is Zehrs/Loblaws/Superstore chain and they have the best gluten free selection. Hey Danica, Did you run hot water over the molds? I find this is the only way I can get them out! I am on a mango – peach – almond mil popsicle kick, you should try this flavor it is totally amazing! peach sounds good! Will have to try that out. 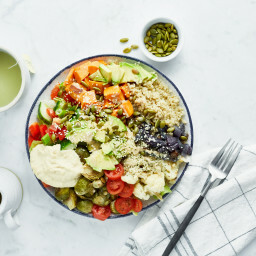 I am vegan and have a full time job, it’s hard sometimes to find the time to cook but I know I can visit your site and always find something delicious to whiz up. I truly appreciate you sharing your recipes! I am amazed by how fast you churn out recipes! You are so talented, Angela! I love May! It’s also my birthday month, so you better believe I celebrate all month long! 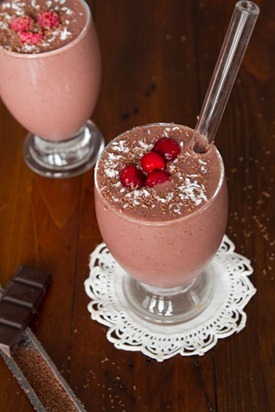 The chocolate raspberry smoothie looks amazing…I tried the “crazy woman chocolate blender pudding” last night and LOVED IT! 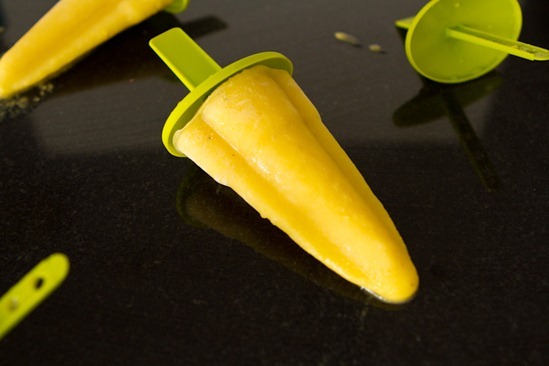 Yes please to the mango popsicles! I just found bags of frozen mango at my dollar store (nothing added, which was suprisingly awesome) and I totally stocked up on half a dozen packages. For a dollar, you can’t lose! I recently bought a big bag of mangos too! I have been using them in smoothies all week. Now I have to try your chocolate raspberry smoothie recipe. It looks devine! All of these are making me wish I had them for breakfast round 2!!! Love the shots, especially the popsicle ones – not bad for a one-woman show! ;) I’ve also been filling my popsicle holders with fruit mixes, but need to hit up Costco soon for some more ingredients. The berry paraits sound lovely too… maybe they’ll be part of my Mother’s Day brekkie menu… especially since I’m picking up my Vitamix this weekend! :D Have a great day Ange! I love mango!! The Thai restaurant I adore adds coconut to their mango ice cream- I’m going to try these pops with and without! :) YUMMM! I have started making popsicles too! I found great molds at the dollar store. Tonight I’ll be making your mango ones.My easiest and favorite was plain watermelon – just pureed and tossed in the mold. 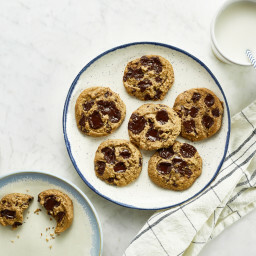 Easy and delicious and stops me from eating cookies at night! Watermelon sounds lovely…mmm Wish I had one right now post workout! Love these recipes, especially the popsicles! Loving the cacao smoothie. Actually, loving all of it. Thanks Angela! 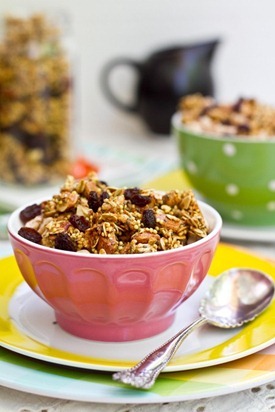 Thanks for sharing, Angela – I love the idea of a Banana Soft-Serve and Granola Parfait! Now, I have a question for you. 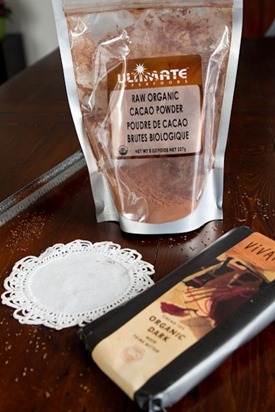 I love my Raw cacao powder too, but I’m a little confused – as far as I know, it is pretty much the same as cocoa powder (http://www.ehow.com/about_5398517_cocoa-powder-vs-cacao-powder.html). Perhaps you have some insight? I don’t want to be scammed paying extra for “raw cacao” when it is virtually the same as plain ol’ cocoa! Hey Kasandra, From what I have read raw organic cacao powder differs in a couple ways. It isn’t heated at high heats (usually below 115F although youd have to check with the specific brand), which is supposed to preserve the vits and minerals. Also, since it’s organic the beans aren’t treated with chemicals, which is also true for organic cocoa powder too of course. What I love most about it is that it has a great intense chocolaty flavour. I notice it a lot more in my baked goods and it’s quite strong! Do I think you have to buy raw cacao powder? Definitely not, but it’s a fun change once and a while. Of course, you can also experiment with different types of cocoa powders too, they vary a lot in flavour/intensity. Something else I want to play around more with! I love Rapunzel brand cocoa powder. I’ve gotten it at Whole Foods, but I see you can also “subscribe” to get it at Amazon (free shipping). I just so happen to have fresh mangoes right now… perfect for today! We’re going to get back up to 80! oh, this looks super yummy, super nice right now in Cali, so I have to try these out. Thanks for the recipes! Heavenly! I love how these are all treats yet so healthy. And I hear you about the weather in May – it’s just as crazy over here in Van! Happy Birthday Month! I love May, it’s my birthday month as well (actually, my birthday is today!). 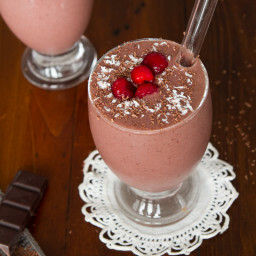 I might just have to make the chocolate raspberry smoothie for dessert this weekend. I made your chocolate cupcakes with almond buttercream frosting for my birthday “cake” for today, so I cannot WAIT to try them. They smell so good!! Looks like the popsicle mixture would be yummy as a pudding too! What the — ?! Why, for the love of Bono, did I never think of freezing mango puree??? Duh! Thanks for the recipes! I’m a new mother and I will store those Popsicle in my mind for toddler years! Too funny…I was just on White on Rice’s site the other day asking them about popsicle holders b/c I was searching Amazon trying to find “the perfect ones” for some popsicle-making of my own…and now I see yours. Great recipe! What kind of popsicle-holders is that and do you like them? YUM! I can’t wait to make these popsicles they look great. I love mango but often forego buying it because I don’t like peeling either. No I havent but I will check it out sometime, thanks for the tip. Awesome! 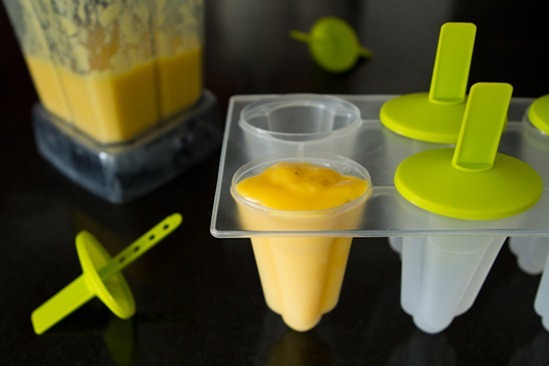 This is the first recipe to make me want a popscicle mold! When I think frozen treat, I want creamy not juicy. As usual, you rock the most. 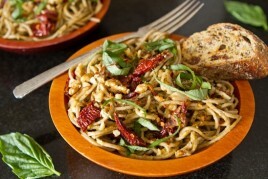 Adding sun dried tomatoes and mango chunks to my grocery list. I just this week started craving some warm weather foods. I never thought the day was coming! Thanks for the ideas. 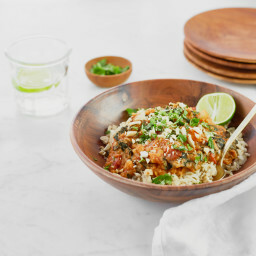 Love how simple the recipes are! And that simple chocolate sauce looks delicious. Perfect timing! Just looking for more snack ideas. & Loving mangos these days. 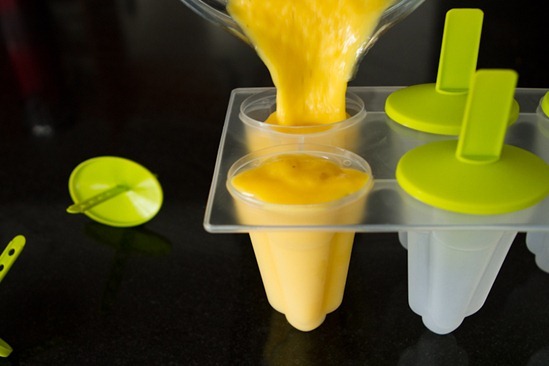 Those mango popsicles sound so good right now!! I have a bag of frozen mango from Trader Joe’s that I’ve been trying to figure out what to do with. What kind of popsicle mold do you use? They all look so good. Thanks Ang! We love those mangos. I also love your picture in the cute red coat….pretty! As of today I am the proud owner of a Vitamix! (and dry grains container) Is it strange that I’m marking this as a big day in my life? I can’t wait to use my new blender and the recipes you posted sound like a great way to start. Especially the chocolate raspberry smoothie. Although I’ve been on a frozen cherry kick lately so I will probably go that route. Then nut butters then pesto….Thanks! 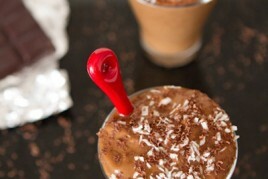 Where did you get that clear drinking straw in the Chocolate raspberry smoothie pictures? 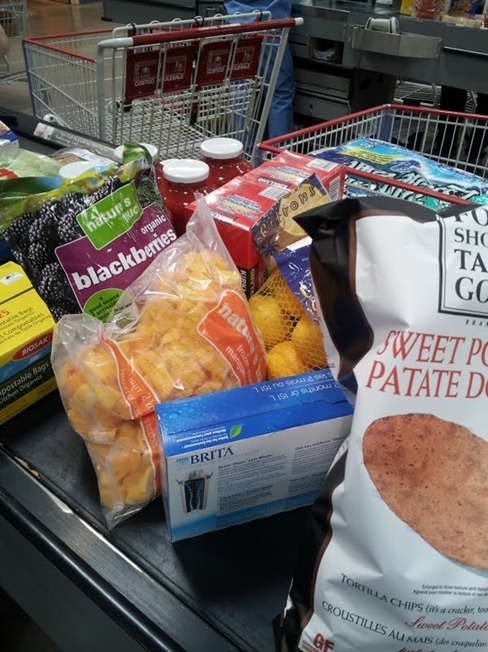 My Costco doesn’t have the giant bag of frozen mangoes or the sweet potato chips. Blast! Both look delicious! Lol, I love those chips! They make a Lime flavor too that’s really yummy! Anyways, I must get a popsicle mold for this summer. My poor little girl was at my in-laws one day and they offered her a popsicle and she didn’t even know what it was. I would love to let her help me make some healthy popsicles though! I usually buy frozen mango too, don’t feel bad. It’s so annoying peeling the slimy “meat” out, haha! Yum!!!! So delicious! Can’t wait to try this! Your blog and story are so inspiring! Keep up the great work!!! Wonderful! I especially love the mango popsicle! Thanks :) Its my fav jacket b/c the hood is HUGE! Yum Angela! I want one of everything right now!!! Those sweet potato chips are totally addictive. We found them at Trader Joe’s & now we’re hooked. The same thing happened with frozen mango. I always end up just eating them from the bag & then not having enough left for a recipe. I’d love to know where you got those popsicle molds. My toddler would go nuts for those. And they look like the perfect size. These are actually genius staples for this kind of weather. For a weather this hot, a homemade popsicle stick sounds perfect for an afternoon snack right now. 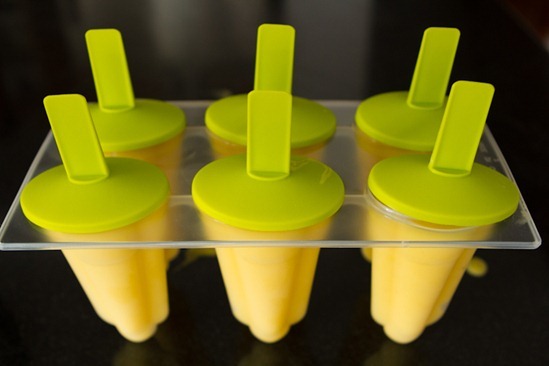 Those mango pops look amazing… I will be definitely trying those out as soon as I can get to the dollar store for some popsicle trays. Those sweet potato chips are so crazy addicting ! Okay, you have to tell us, where did you get your coat from?! It’s amazing! Thanks Stephanie! it`s from RW & Co, last winter 2011. 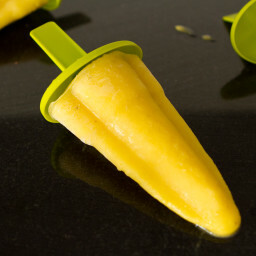 Ohh those mango popsicles look amazing!! That’s usually my go-to combo for a breakfast protein smoothie. I just bought some popsicle molds on the weekend and they have been sitting on the counter and I must look at them 20 times a day since then, thinking about what flavor to try first. Bingo! found it! Let us know how the margarita ones turn out. I’m on a total margarita fix this year and have never been before. ah! These are all perfect for busy summer days! Thanks!